Looting has apparently begun in Florida amid Hurricane Irma, according to a report and video footage from ABC affiliate WPLG. 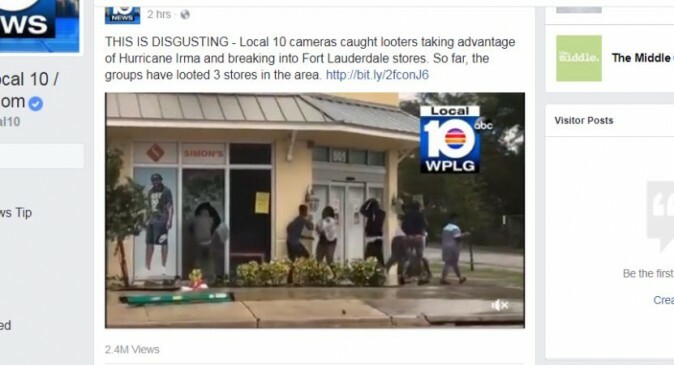 The looters were caught on camera breaking into shoe stores in Fort Lauderdale Sunday, Sept. 10 despite dangerous winds and storm surge from Irma, a Category 4 hurricane. Police later confirmed that nine people had been caught and arrested in connection with the robberies. They were seen breaking into Simon’s Sportswear on Sunrise Boulevard and Powerline Road. They apparently smashed a window to get inside before walking out with some stolen goods. According to WPLG, they then broke into a Footlocker and CashAmerica Pawn Store in the same area. Police have also arrested two men who are suspected of burglarizing six homes in Fort Lauderdale, the Sun Sentinel reports. In Broward County, two teens were caught breaking into a home at 3 a.m. on Sunday, Sept. 10, the Broward County Sheriff’s Office reported. One was shot by police and is in the hospital with nonlife-threatening injuries, and the other has been arrested. 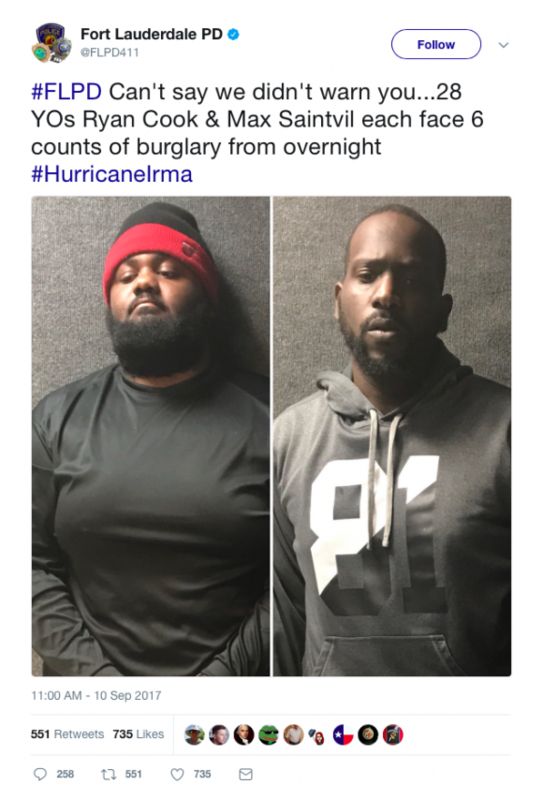 “Any looters who come to Pembroke Pines will be greeted by our officers. Choose wisely and stay home,” the police department of Pembroke Pines, a city in Broward County, tweeted. In Houston, after Hurricane Harvey flooded the city, there were reports of rampant looting. Hurricane Irma hit the Florida Keys at 9:10 a.m. ET on Sunday, and according to the U.S. National Hurricane Center, it was downgraded to a Category 3 storm as it moved up the Florida coast. The storm has 120 mph maximum sustained winds and “continues to batter South Florida,” the agency stated at 2:15 p.m. ET.